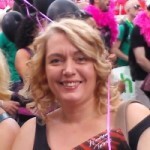 28 years after forming to add some musical magic to Pride London the Pinkies took to the streets of of the city once more to celebrate on 2 July 2011. No matter how many times we march there is always a palpable air of excitement as we gather before the off. This time we arrived complete with thousands of flyers, hundreds of baloons and a huge canister of helium (thanks Cat and Jenny! ), we blew up as many as we could and almost set Sarah aloft as we attached one too many to her wheelchair! Thankfully disaster was avoided by Pinkies tying as many baloons to themselves as possible. 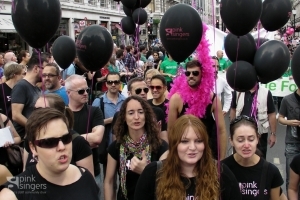 This year we were marching between the London Gay Symphonic Winds (LGSW) and The Food Chain. We moved off to the sound of It’s Raining Men and of course we all sang along, in fact we sang along every time the LGSW played and did our best to fit in some of our own numbers when ever the band stopped, which never seemed for long enough. Note to selves: next year we must remember to request a slot next to a quieter group! Previous Previous post: A glimpse of stocking was rather shocking!